If it's Monday, there must be another Marvel movie in the theaters. The latest, directed by Peyton Reed, covers the adventures of Ant-Man, a relatively — ahem — small character, who nonetheless is needed both to fight villains and expand the Marvel Cinematic Universe. A good-guy hacker named Scott (Paul Rudd) is recruited by retired scientist Dr. Pym (Michael Douglas) to be Ant-Man. After donning a special suit, Scott gains the ability to shrink while retaining super-strength, and to communicate with ants telepathically. (Getting small and mind-melding with insects seem wholly unrelated technologies, but whatever.) Pym needs Ant-Man to help him take down his protégé-turned-rival (Corey Stoll), who has developed a weaponized wasp. (Bug vs. Bug!) It's less an actioner than a training story combined with a heist caper. 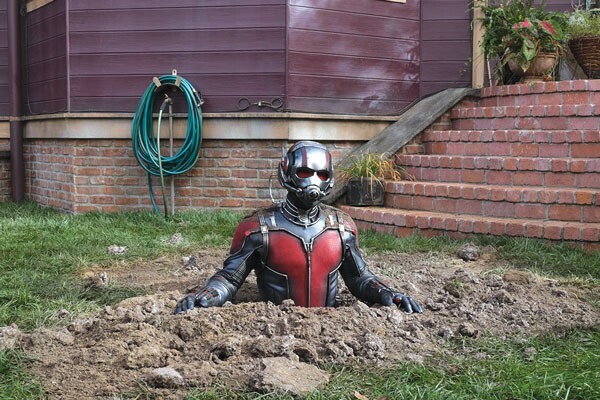 First, the good news: Ant-Man is entertaining enough (especially given the low bar of mid-summer releases). It is looser and funnier than its Serious Comics brethren and — surprise — the best laughs come from basic human interaction that has little to do with super-heroics. (Michael Pena, as Scott's buddy, steals every scene, and scored the biggest laughs with his motor-mouthed recounting of extra-narrative events.) And there are some inspired bits that bear the offbeat sensibility of the film's original writer and director, Edgar Wright (Shaun of the Dead). But then again: The film shows signs of its troubled development, with the tone awkwardly shifting between snarky and comic-book serious. Even at only two hours, Ant-Man is too long for its slim tale, and let's not speak of the awkward, sentimental family subplots. A flashy set piece that finds Ant-Man battling an Avenger feels shoe-horned in to satisfy some MCU mandate. Somewhere in this muddled affair is a sharp, funny, appropriately lightweight Marvel diversion, but viewers will just have to edit as they go.